The Satellite View with Cloud Cover is a stunning and calming depiction of earth. The serene colors and natural design make it easy to stare at for hours, daydreaming as the clouds float by. The MOVA Globe turns gently and silently inside a clear acrylic shell. No batteries or wires required! 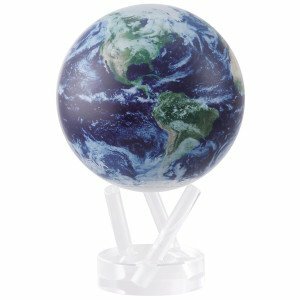 Simply place the MOVA globe on its stand, and your MOVA globe will come to life and start to turn when exposed to natural or artificial light. If you have any questions about this product by Mova, contact us by completing and submitting the form below. If you are looking for a specif part number, please include it with your message.